Cmple offers many innovative products to let your home theater, audio/visual system and internet network perform at their best while also helping your living spaces to look their best. A perfect example is this unusual but extremely well-designed wall plate, which combines a recessed AC power outlet next to a recessed opening for multiple low-voltage cables, all in one beautiful white package which will blend in perfectly with its surroundings. You can probably already visualize one or two places where this product would be particularly handy in your home. For example, it can go behind your high-definition television so the TV plugs into the wall and input cables from your audio system, Blu-ray player and other components can be fed through right next to the AC power; or HDMI cables from the television can be fed out through the plate and into the wall, since the opening will accommodate as many as four or five thick HDMI cables. Or you can have the same type of setup behind your audio receiver to handle not only all of the input cables from components, but those going out to your TV and speakers. Installing this two-gang wall plate – which would probably become a conversation piece if it weren’t so unobtrusive – is surprisingly simple. 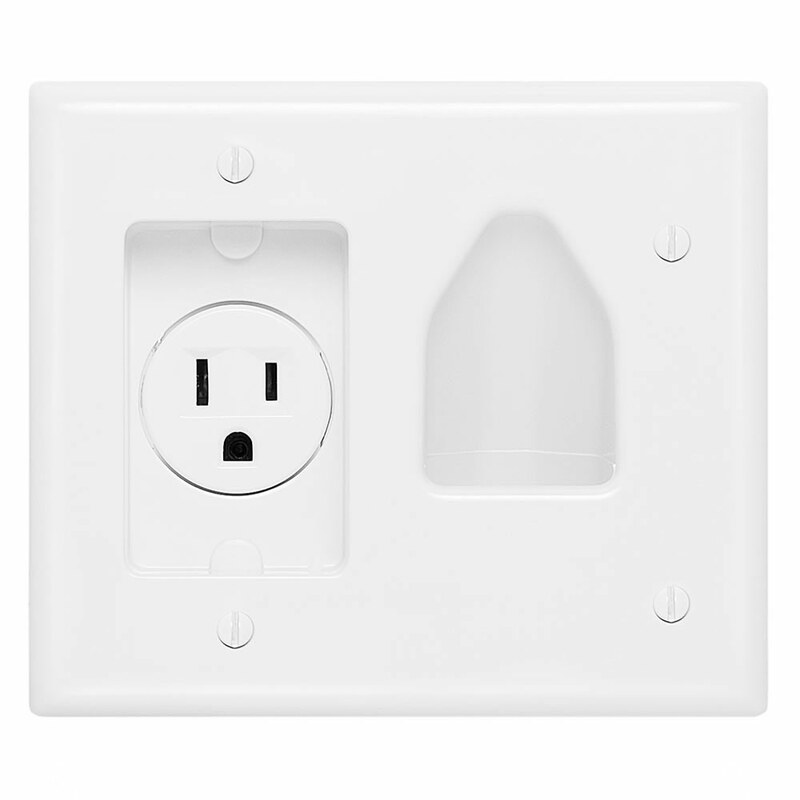 In fact, you can just take out an existing two-gang wall outlet and install this one in its place. If you’re placing it where there’s currently a one-gang power outlet, all you have to do is remove the old one and cut the drywall so the new wall plate fits right into place; no additional wiring is necessary. As you can tell from its name, this is a recessed plate so any power cable will fit snugly into it; there’s also a convenient conduit behind the plate so all of the low-voltage cables being fed in or out of the opening can be managed easily and no one will be able to see drywall or insulation behind the wall plate. And it can be installed “right side up” or “upside down,” whichever is more convenient. These days, the hassles of running power and cables throughout a home theater, family room or complete home are growing rapidly as the number of components in a system – and the number and type of cables they require – seems to multiply like rabbits (no offense meant to any rabbits reading, of course). 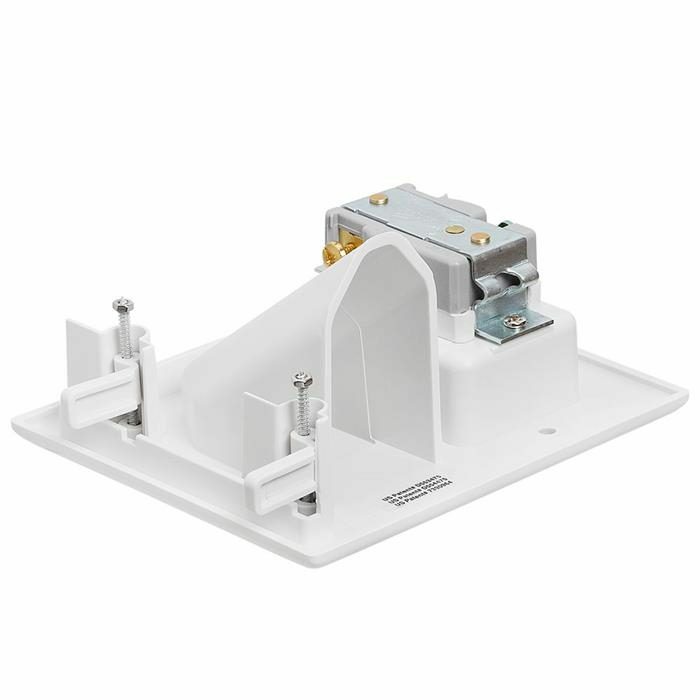 This Cmple recessed low-voltage cable plate with recessed AC power helps eliminate some of those hassles simply and permanently, at a surprisingly low price well under twenty dollars.